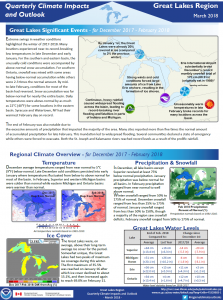 The “Quarterly Climate Impacts and Outlook: Great Lakes Region” is a brief bulletin published jointly by the National Oceanic and Atmospheric Administration and Environment and Climate Change Canada, summarizing the latest season’s weather and water level conditions and weather and water level-related impacts over the Great Lakes and provides an outlook for the upcoming quarter. It is published roughly four weeks after the end of each season. The geographic scope covers the Great Lakes basin and includes the international portion of the St. Lawrence River. It is published in March, June, September and December covering Winter (December-February); Spring (March-May); Summer (June-August) and Fall (September-November). This entry was posted in Climate Change Impacts (Annex 9), Documents, Quarterly Climate Impacts and Outlook and tagged climate, extreme weather, water levels, cold temperature by . Bookmark the permalink.